Hand-painted, 4" x 3 1/4" glass slide from "The Mounted Stranger" (1930), starring Hoot Gibson. 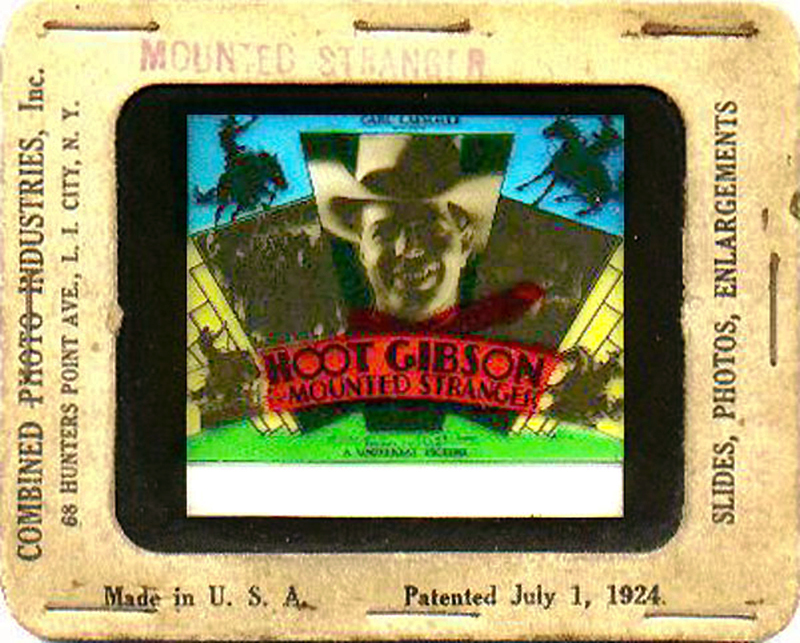 The original "trailers," painted glass slides were inserted into movie projectors and shown on the silver screen to promote coming attractions. In this Arthur Rosson film, a young Pete Ainslee (Buddy Hunter) sees Steve Gary (Fred Burns) kill his father. Years later, and older Ainslee (Gibson) avenges his father's death. Written by Rosson and Henry H. Knibbs, this 66-minute talkie also stars Milton Brown, Jim Corey, Francis Ford, Walter Patterson, Francelia Billington, Louise Lorraine, Malcolm S. White and Pee Wee Williams. Released February 8, 1930 by Universal Pictures (A Hoot Gibson/Universal production).